Random House Books for Young Readers, 9780394800790, 64pp. The Dr. Seuss holiday classic How the Grinch Stole Christmas is now a major motion picture from Illumination Presents – Dr. Seuss’ The Grinch! Grow your heart three sizes and get in on all of the Grinch excitement with the original How the Grinch Stole Christmas—the ultimate Dr. Seuss Christmas classic that no holiday season is complete without! “Every Who down in Who-ville liked Christmas a lot . . . but the Grinch, who lived just north of Who-ville, did NOT!” Not since “’Twas the night before Christmas” has the beginning of a Christmas tale been so instantly recognizable. This heartwarming story about the effects of the Christmas spirit will grow even the coldest and smallest of hearts. Like mistletoe, candy canes, and caroling, the Grinch is a mainstay of the holidays, and his story is the perfect gift for young and old. 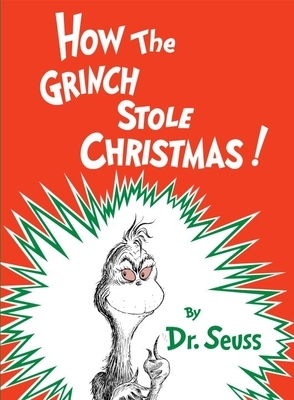 And don't forget to celebrate Grinch-mas this Christmas season, the annual holiday tradition inspired by How the Grinch Stole Christmas that encourages readers to grow their hearts three sizes by doing good deeds! THEODOR SEUSS GEISEL—aka Dr. Seuss—is one of the most beloved children’s book authors of all time. From The Cat in the Hat to Oh, the Places You’ll Go!, his iconic characters, stories, and art style have been a lasting influence on generations of children and adults. The books he wrote and illustrated under the name Dr. Seuss (and others that he wrote but did not illustrate, including some under the pseudonyms Theo. LeSieg and Rosetta Stone) have been translated into thirty languages. Hundreds of millions of copies have found their way into homes and hearts around the world. Dr. Seuss’s long list of awards includes Caldecott Honors for McElligot’s Pool, If I Ran the Zoo, and Bartholomew and the Oobleck, the Pulitzer Prize, and eight honorary doctorates. Works based on his original stories have won three Oscars, three Emmys, three Grammys, and a Peabody.